Chances are great that when driving to Yosemite, you will pass by the historic Priest Station. 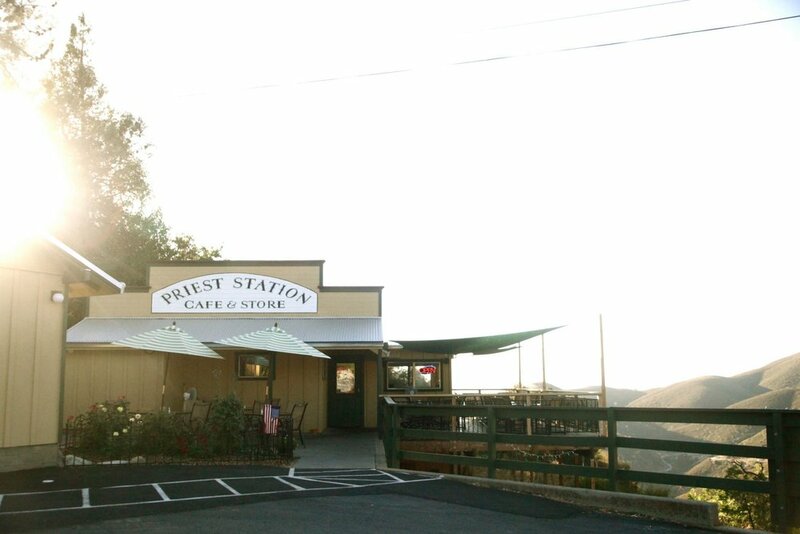 Situated at the top of the ridiculously steep (rising 1,500 feet in 2 miles) Old Priest Grade road on the corner of Hwy 120, Priest Station has been a regular stop since its heyday during the Gold Rush. Originally the site of the Rattlesnake mining supply store, the spot was purchased by the Kirkwoods in 1855, who then added rooms to accommodate weary stage coach travelers. When Alexander died in 1870, his wife Margaret went on to marry William Priest, and the hotel became known as the Priest Station ever since. Eventually falling under the ownership of Margaret's grandniece (another Margaret) in the 1930s, she and her husband, Joe Anker, ran the Priest Station until they sold it in 1969. For 38 years, the historic location changed ownership 5 times until in 2007, Margaret and Joe's son Wally Anker, together with his wife Helga and their children, bought the property back. They spent the next 2 years cleaning it up and renovating to what it is today. The Priest Station Cafe serves up classic American fare, including the popular choice of local grass-fed beef burgers or 6 oz. certified angus burgers (don't forget the sweet potato fries). Be sure to snag an outside table to enjoy the panoramic mountain views as you take a break either on your way in to Yosemite or to refill those glycogen stores on your way out. In addition to the cafe at Priest Station, you will find two 1940s cabins available for rent. If you want to get your hands on a little bit of climbing history, be sure to use the restroom when dining—the keys are fashioned out of Conrad Anker's old ice screws.